Boston College will be one of four teams competing for the 2010 NorthEast Ice Hockey Championship at the DCU Center this weekend March 27 and 28. There should be quite a few BC fans at the Worcester DCU Center since it is only 45 or so minutes from Boston. 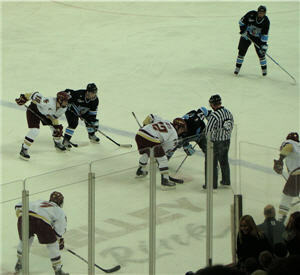 Boston College fought tooth and nail with Maine this past weekend at the TD Bank Garden. They won the game in overtime after Maine clawed there way back into the game to bring it to a 6 to 6 tie. Worcester’s DCU Center is no stranger to exciting hockey. The Worcester Sharks play there regularly. The Worcester Sharks are sitting at first place in the Atlantic Division and should be playing in the 2010 Calder Cup Playoffs. They also broke their franchise attendance record this past Saturday night. Sadly BC is the only Massachusetts team making the NorthEast Regional SemiFinals. They play Alaska on Saturday and it they win they get to play for the NorthEast Regional Championship on Sunday. Tickets are still available as of this writing. You can even purchase a Season Ticket Pass that would give you access to all 3 games this weekend. The Regional Champion will go on to the Frozen Four in April. The 2 other teams playing are North Dakota and Yale so you may also see a lot of Connecticut plates around this weekend too. If you are a college hockey fan this event is sure to offer some exciting play. You can find more information on the Worcester DCU website. You can also find more information about the rest of the Worcester Sharks season on their website.